The KC Streetcar project team, consisting of the KC Streetcar Authority (KCSA), the KC Area Transportation Authority (KCATA), the City of Kansas City, MO (KCMO), and the consultant team led by HDR, Inc., has continued to work on the concept study for the Main Street Extension to UMKC, including work on streetcar stop locations, alignments and design considerations. 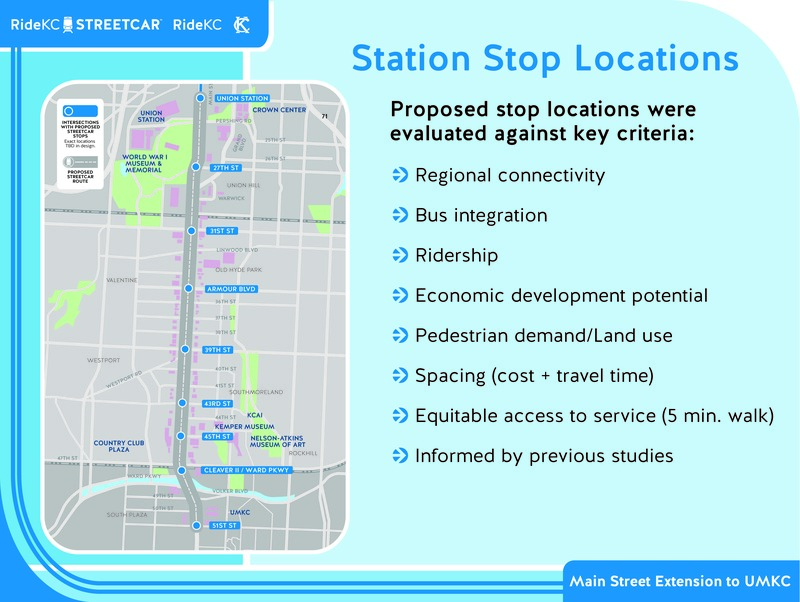 Since the first public meeting held in April, the project team has made adjustments to the proposed stop locations based on further design analysis and community input. This data driven process includes inclusive work with community members and organizations. A full report of the streetcar stop analysis can be found here. Modifications to the station stops include replacing the previously proposed Linwood stop with a 31st Street stop and acknowledging the Cleaver Blvd stop will need to shift south of Cleaver Blvd, currently identifying it as the Cleaver/Ward Parkway stop. A summary page of these stop locations can be found here. A news release about the proposed streetcar stop locations can be found here.